I bought this wine for two reasons: First, fellow blogger Talk-A-Vino had given this particular wine an honorable mention in this post. Second, Nina and I have been on a mission to become Wine Century Club members. For those not in the know, you can become a member in this club once you have tried 100 (hence the century) different grape varieties. It is completely based on an honours system of reporting and membership is free. While I am pretty certain that I have had more than 100 grape varities in my life, I am only counting those that I actively remembered, so I am still a bit short. This wine is a blend of four grapes that I did not have on my list, so it brought us closer with even just one sip…I think it is a fun way to expand our knowledge of grapes and horizons by trying to get to the magic number. Let me start by saying that I am not the biggest white wine fan, aside from Riesling, Gewürztraminer and Sauvignon blanc. I find a lot of the other whites I try uninspiring and lacking in exciting flavors and aromas. That said, we were excited to try four grapes we had never heard of: Bourboulenc, Grenache blanc, Ugni blanc and Roussanne. 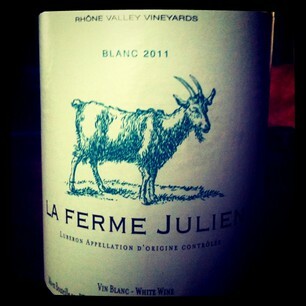 For short, I will just call this La Ferme Julien blanc. I bought the bottle at Trader Joe’s for $5.99. The wine has 13.5% ABV, and, according to its back label, has been blended by the Perrin family, a well respected French négociant. You can find their wines on all levels of pricing and quality. I was surprised to find their name on this wine! The wine showed a light yellow in the glass, with hints of green. On the nose, it was incredibly fruity: initial notes of yellow apple, peach and floral aromas. Later on I got banana (I think; Nina agreed). It was a really appealing and refreshing nose. On the palate, light bodied wine was dry, rather bland with light citrus aromas and a certain creaminess to it. There was slight strawberry, I think, but for me it was all overpowered by the alcohol, which also left me with some bitter notes at the finish, which I did not enjoy much. In a way, this wine seemed to highlight my problem with higher alcohol white wines (not reds! ): they become too heavy on my palate, when I want something fresh and clean. I felt like this wine would have been great at maybe 12% ABV, but that bit more made it hard for me to like it. The nose was fun, but the taste – not for me. yes, the finish is assertive…but for those of us who seek the stringency of retsina in a bottle with a screw top and a french label–it’s perfect! Get to the Century! It will change your life! We will never catch Anatoli though. He drinks 18 different new varieties every week! Interesting but not very surprising, Ken totally agrees with you about whites. Reading your notes is like listening to him talk. 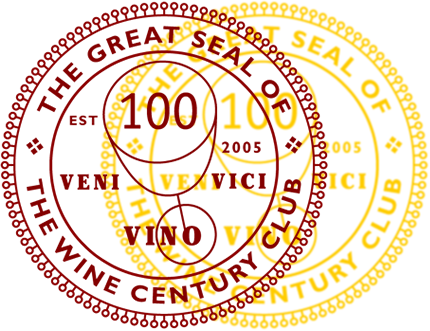 The Wine Century Club has a downloadable pdf file with a number of grapes on them so you can tick them off quite easily. It definitely is fun. Thanks for the nod! I didn’t try the 2011, but 2010 was quite nice.